The parathyroid glands are small endocrine glands found in all tetrapod (four-limbed) vertebrates (that is, except fish) and that produce parathyroid hormone, which regulates calcium and phosphate levels in the extracellular fluids. The parathyroid gland is generally located near the thyroid gland. The vertebrate body is a wonder of intricately coordinated mechanisms which maintain homeostasis (balance) for proper functioning. Calcium homeostasis is particularly important for optimal operation of the nervous system and muscle contraction. Whereas fish can adjust calcium levels through uptake from the water, tetrapods, such as amphibians and birds, have internal mechanisms of control. When more calcium is needed, the parathyroid gland stimulates movement from calcium stores in the body (bones) as well as aids in retention from what would be lost through the urinary system. It does this through a complex system of detecting the need for more calcium and releasing a hormone that travels through the circulatory system to distant parts of the body, where it carries out a diverse array of actions related to calcium homeostasis. In humans, there most often are four parathyroid glands, in pairs of two, but some people have as few as two or three, and as many as six or even eight. The human parathyroid glands are located in the neck, usually on the posterior surface of the thyroid gland, although in rare cases they may be located within the thyroid gland. Parathyroid glands are considered part of the endocrine system, which is a control system of ductless glands and single cells that secrete chemical messengers called hormones. These hormones pass directly from the glands into the body and are transmitted through the blood or via diffusion, rather than being secreted through tubes. In the case of the parathyroid glands, this chemical messenger is the parathyroid hormone, or parathormone. It acts to regulate calcium and phosphate metabolism, targeting movement of calcium from bones into extracellular fluids (increasing calcium in the fluids); inhibiting renal reabsorption of phosphate (increasing loss of phosphate from the body); and elevating renal reabsorption of calcium (increasing retention of calcium). On the other hand, the thyroid gland produces the hormone calcitonin, which acts to decrease calcium concentration. 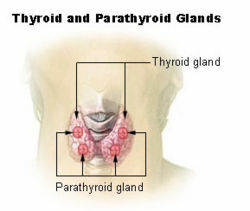 The parathyroid glands were discovered by Ivar Sandstrom, a Swedish medical student, in 1880 (Eknoyan 1995). It was the last major organ to be recognized in humans. parathyroid chief cells darker many smaller manufacture PTH (see below). oxyphil cells lighter few larger function unknown. The sole function of the parathyroid glands is to regulate the calcium level in the body within a very narrow range so that the nervous and muscular systems can function properly. Extracellular calcium is important for muscle contraction, blood coagulation, and synaptic activity (Okabe and Graham 2004). Thus, regulation of calcium homeostasis is of paramount importance. When blood calcium levels drop below a certain point, calcium-sensing receptors (CasR) in the parathyroid gland are activated to release hormones into the blood from stores such as bone, as well as regulating reabsorption. Parathyroid hormone (PTH, also known as parathormone) is a small protein that takes part in the control of calcium and phosphorus homeostasis, as well as bone physiology. In the bone tissue, PTH causes uptake of calcium from the bone fluid, resulting in its movement into the extracellular fluids and blood. It also stimulates osteoclasts to break down bone and release calcium into the blood. In the kidney, PTH increases calcium reabsorption such that not as much is lost in the urine, while at the same time decreasing phosphate reabsorption, thus increasing loss through the urine. It is also believed that PTH increases gastrointestinal calcium absorption. The single major disease of parathyroid glands is over-activity of one or more of the parathyroid lobes, which results in too much parathyroid hormone and causes a potentially serious calcium imbalance. This is called hyperparathyroidism; it leads to hypercalcemia and osteitis fibrosa cystica. Since hyperparathyroidism was first described in 1925, the symptoms have become known as "moans, groans, (kidney) stones, and (fractured) bones." The primary treatment for this disease is the surgical removal of the faulty gland. Modern high frequency ultrasound can see parathyroid masses, even before they cause high calcium. They are called parathyroid incidentalomas. If a patient has elevated calcium, the ultrasound can be used to locate the abnormal glands. The use of ultrasound guided FNA and parathyroid hormone washings can confirm the abnormal glands. A blood calcium level taken 15-30 minutes after the biopsy can help determine if the disease is caused by a single abnormal gland or multiple glands. A drop in serum calcium suggests a single source and no drop suggests multiple glands. This, with a non-localizing Sestamibi scan, would point toward a neck exploration, rather than a minimally invasive method aimed a single gland disease. A Sestamibi scan is often used to determine which parathyroid gland(s) are responsible for overproduction of parathyroid hormone. When the thyroid is removed for medical reasons, it is critical that the parathyroid glands be left intact. Disorders of the parathyroid hormone receptor have been associated with Jansen's metaphyseal chondroplasia and Blomstrand's chondroplasia. The parathyroid glands originate from the interaction of neural crest mesenchyme and third and fourth pharyngeal pouch endoderm. In humans and chickens, the parathyroid glands arise from the third and fourth endodermal pharyngeal pouches, while in mice, they arise from the third pouch only (Okabe and Graham 2004). Genetically, Eya-1 (transcripitonal co-activator), Six-1 (a homeobox transcription factor), and Gcm-2 (a transcription factor) have been associated with the development of the parathyroid gland, and alterations in these genes alters parathyroid gland development. The conserved homology of genes and calcium sensing receptors in fish gills with those in the parathryroid glands of birds and mammals is recognized by evolutionary developmental biology as evolution using genes and gene networks in novel ways to generate new structures with some similar functions and novel functions. Okabe and Graham (2004) note that fish, believed to lack parathyroid glands and parathyroid hormone, get their calcium from external sources, but with a shift from aquatic to a terrestrial environment, tetrapods required new means of regulating calcium homeostasis. The evolution of the parathyroid glands and PTH is considered a key event in the transition, freeing tetrpods from relying on uptake from the water and allowing internal regulation. Eknoyan, G. 1995. "A history of the parathyroid glands." Am J Kidney Dis 26(5): 801-807. Graham, A., M. Okabe, and R. Quinlan. 2005. The role of the endoderm in the development and evolution of the pharyngeal arches. Journal of Anatomy 207(5): 479–487. Retrieved January 11, 2017. Okabe, M., and A. Graham. 2004. The origin of the parathyroid gland. PNAS 101(51): 17716-17719. Retrieved January 11, 2017. Parathyroid disease and treatments discussed in layman's terms at Parathyroid.com. 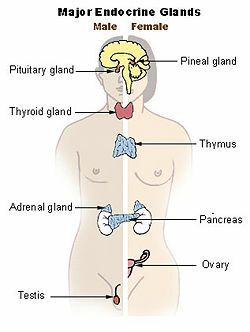 Your Parathyroid Glands at endocrineweb.com.